You can see what I made of the coffee after the gallery. However, when I got to the North Lounge in Terminal 5 at Heathrow, there was no doubt. As you walk in, there’s a large coffee bar to your left which has several large “Union Hand-roasted Coffee” signs plastered above the coffee machines, and the distinctive Union “U” is on all the cups. I think it’s safe to say that Union Hand-roasted coffee has been rolled out to the Heathrow lounges. The coffee is made with large bean-to-cup machines, serving the usual push-button espresso options. Since I really wanted to be able to taste the coffee in its purest form, I decided to have an espresso. I put the cup under the twin spouts, pressed the button and held my breath (well, actually, I didn’t: I took lots of photos). The coffee looked pretty good coming out, but the real question is how did it taste? Pretty good, actually. It was a rich, full-bodied coffee and while it’s never going to convert light, bright, acidic espresso drinkers and was a little bitter for my tastes, it was perfectly drinkable and one I’d happily have again. It’s even more impressive when you consider it came from a large bean-to-cup machine: I’ve had a lot worse in supposedly good coffee shops. So, that’s definitely a thumbs-up for Union and the lounge coffee. But what was it like in the air? You can find out after the gallery. Having set the expectations suitably low, my post-lunch coffee was okay. I’m not going to claim that it was anything special, but it was perfectly drinkable, although it could have done with a little more body. I’m trying hard not to be too critical, but if I’m honest, I was a little disappointed. It’s certainly a lot better than the vast majority of airline coffee that I’ve had, but it didn’t leave me wanting another cup. In order to have something to compare it to, I decided that I should make some coffee for myself, so later on I popped up to the galley with my Wakecup, Aergrind, Travel Press and some beans I’d recently received from Manchester’s Grindsmith which I’d been enjoying at home through my cafetiere. One of the perks of flying Club World is that the cabin crew are generally happy to let you hang out in the galley and, in my case, make some coffee. Tony, the member of the cabin crew on duty, was fascinated that I was making my own coffee and was particularly interested in my coffee-making equipment. We had a long chat while I made my coffee and it was a pleasure to talk with someone as well-informed as Tony. Then it was crunch-time. How did my coffee stack up? Well, it wasn’t the perfect cup of coffee, but it was pretty good. Sorry, Union (and British Airways), but in this sample of one, I still (marginally) make a better cup of coffee. In Union’s (and British Airways’) defence, I was using freshly ground coffee and making a single cup for myself, rather than trying to serve an entire cabin at the time. See what I made of the coffee on the return flight from Tokyo. You can also read about my visit to the Union roastery where I chatted about the challenges of the British Airways contract. 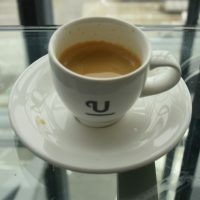 To summarise, the introduction of Union Hand-roasted in the lounges is a definite success, while there’s still room for improvement when it comes to the in-flight coffee, although the environment is not working in anyone’s favour there. I’ll definitely be visiting the lounges for coffee again, although I’ll be keeping my coffee kit in my hand luggage for the foreseeable future when it comes to actually flying. I don’t want to come across as too critical though. I started this piece by applauding British Airways for stepping up its coffee game, but equal praise needs to go to Union. Not ever roaster would be prepared to put its coffee in such a high-visibility location, where there’s relatively little control over how the coffee is made and plenty of potential for things to go wrong. Both British Airways and Union need to be encouraged, not knocked, and other airlines need to follow their lead, although I believe that Virgin Atlantic has recently upped its coffee game too (that said, I’ve not flown with Virgin for ages). December 2018: Improving Airline Coffee: British Airways & Union Hand-roasted has won the 2018 Best Saturday Supplement Award. This entry was posted in Brian's Travel Spot, Coffee, Discussion and tagged Union by Brian Williams. Bookmark the permalink. This is not good news, indeed it is very bad news. We are seeing record high temperatures this summer. This is not the new norm, this is the beginning of relentless rise in global temperatures as climate change kicks in. Clifton supply coffee to Cosy Club. A corporate chain of fake 1930s bars, so fake a parody of fake. The coffee served in Cosy Club Guildford is undrinkable. If you care about reputational damage, take care where supply coffee.